How far up the row of the knuckles do you go? How can one keep the string on his fingertip? These are questions starting archers ask. It looks easy when you look at it from a viewer’s point; however, it’s actually more difficult that what it lets out. How to hold the string? Some shooters, especially the ones who use an English war bow which is like 120 pounds, like to hold the arrow back and exert all their strength in pulling it. They normally go up to the second knuckle from the finger tips. However, it is not always recommended to use the second knuckles. If you are using a 50 pound bow, you can use the first row of knuckles from the tip of your fingers. That gives you plenty of lock in pulling it back and it’s very comfortable. If you try to ride out on the pads of your fingertips, you are going to have less strength and you are going to shake. This will eventually lead to a very bad release. Always go with your first set of knuckles and use that as a locking point. What is the common problem? Most problems that archers experience are from anchor points and the strength of the release. Wrong application of force can damage your fingers from the pressures of the string. 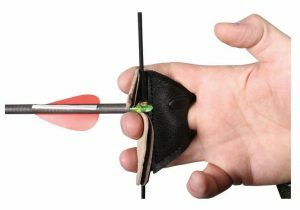 If, for instance, you are using a bow that is 40 pounds, using a quick calculation will show that a pressure of 435 psi should applied on the fingers, that is, 29.9 times the normal pressure. This is quite a lot for your fingers. 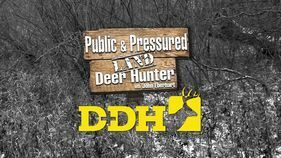 The pressure is dispersed to your fingers so as to make it bearable to shoot. How to remedy the problem? A tab and a glove can play the role of protector. 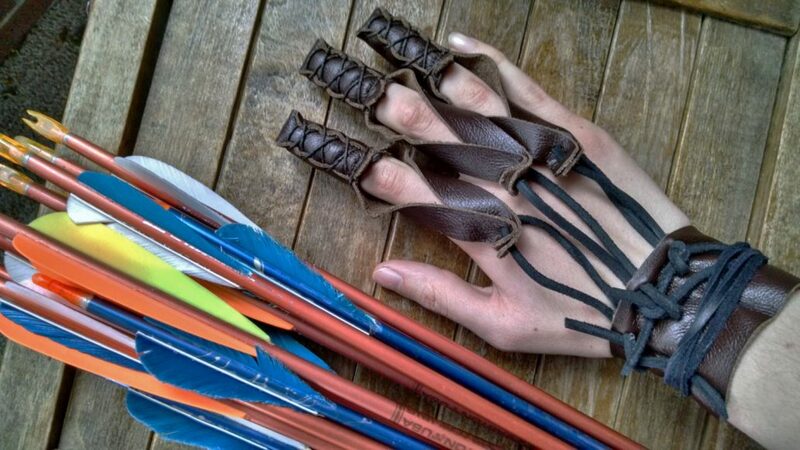 They have finger separators that prevent the fingers from pinching the arrow under the angle of the string, thus avoiding damage to the inside of the index and middle fingers. Most tabs come with special types of leather and synthetic materials like Cordovan, which is the most expensive type of leather. It never crease. As it always stays smooth and rounded, the string just rolls right off in the way you want when you pull and release. Some tabs have plastic layers on the inside. The advantage of using plastic is that it has less sliding friction than a piece of leather. It allows the string to release with a high velocity. If you get a cheap tab, you might get a corner on it which might snag causing a sound when one is releasing a string. For the gloves, most of them come with re-enforced tips on the fingers, like an extra layer of leather or synthetic material. With your glove on, you should be able to use your first knuckle and handle the string easily for a good shot. What’s the difference between glove and tab? Lets’ look at some differences when using a tab and a glove. If you are shooting with a glove, it does not matter how hard or soft your release is. When you draw your string back, you one get 3 different release points, making the string have different contact with the fingers. On the other hand, when using a tab, you have to draw the string to the back and feel the string have one contact with your fingers. There is a hybrid of both things— a palm tab, which is a mash-up of a glove with a tab on top of it directly under the palm. The beauty of this hybrid is that it can be placed at the back of the palm when not in use and placed at the palm when in use. This is without detaching it from the glove. This makes one have a better release than either points. With this note, it is better to make a thicker tab so as not to feel the tab and concentrate on the target. The palm tab makes one not even to feel tired after many shots.